Is This The World’s First Androgynous Beer Bottle? From Denmark, an attempt to recognize that women are beer drinkers too — without all the condescending flowers and pink stuff. We admit, we’re totally mystified by the beer industry. Research has shown that women make up a whopping 25% of the beer market. And yet, with rare exception, brewers seem dead set on portraying themselves as testosterone in a bottle, whether it’s hilariously butch packaging or ads extolling the virtues of Swedish bikini volleyball (or, in most cases, some variation on both). Leave it to Denmark, one of the most gender-equal countries in the world, to mount what might be the world’s first truly gender-neutral beer marketing campaign. But the brewer has smartly refrained from flogging a Ladies Beer — from resorting to the usual strategies marketers deploy on women. It does not, for instance, bill itself as low cal. It is not pink. Contrast Carlsberg to Molson Coors, one of the big brewers marketing explicitly to women with a campaign called the Bittersweet Partnership. The partnership is aimed at making it “OK [for women] to love beer” and has a salmon-pink website complete with a flowery heart logo! Recipes! News updates (?It’s national doughnut week!?)! A Facebook promotion featuring the silky silhouette of four women and the question: ?Are you a beer angel??! We haven’t seen anything so patronizingly femme-y since the last time we watched a tampon commercial. 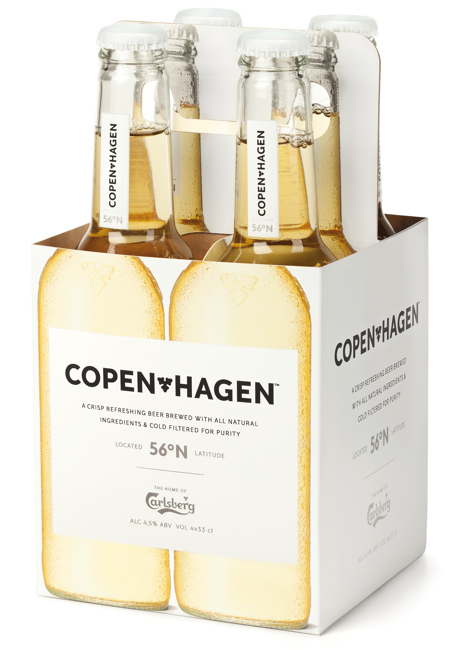 The design blog Below The Clouds worries that Copenhagen is just shtick: “[T]he question is if the trendy people will fall for yet another marketing ploy or stick to their smart, obscure IPAs.” Frankly, that’s beside the point. All beer brewed outside of your basement is marketing. Who knows if Copenhagen will succeed — it’ll be released in Denmark this year and the rest of Europe and parts of Asia next year, though not, apparently, in the U.S. (wtf?) — but it’s a promising development in an industry that’s spent too many years getting drunk on tired gender stereotypes.